The Sew, Mama, Sew! Blog has started a Sewing Machine Meme in order to collect reviews on different types of machines in one place. I’m participating to help others out, and if you sew, I encourage you to do the same. If you don’t sew, I’d suggest to move along, as you’ll most likely get bored. If you’re ever planning on getting a sewing machine, read on! Less than 24 hours. Last night I traded in my Pfaff Select 3.0 for the Expression 2036. I had the Select 3.0 for a little over a year. I bought the Expression used, it’s a 2 year old machine and it was $750. New it maybe worth $900-$1000, but am not sure. Thankfully I didn’t pay as much since I got some money for my trade in. I sew quilts, bags, box bags, some home dec like pillows, no clothing yet but am planning to. I’ve been sewing pretty much every day for the last couple months. But usually I sew at least once or twice a week. Especially when there’s a quilt I want to finish! I really liked my Select 3.0, even if it didn’t have everything I wanted. My new machine has a couple of the features I didn’t have in my old one so I think I’ll like it even more! She doesn’t have a name yet, I’ll have to think about it. I love, love the IDT, something particular to only Pfaff sewing machine. IDT is an integrated walking foot, so no matter what foot you’re using or what type of stitch, you have the dual traction. It’s really a awesome feature and would never go to another type of machine because of that. I don’t think there is, but then again, I haven’t had it for very long! None about the new machine, but one day, the foot pedal on my old machine went bonkers. Whatever was inside the pedal that creates the tension that makes it go faster, slower or stop was broken. So basically, if the machine was on, it was going, and fast. There was nothing else to do but go to the store and get another foot pedal. I would definitely recommend any Pfaff machine, they’re very good machine and the added IDT is again, the awesomest feature. Buy your machine from a local quilt store with friendly staff because they’re the ones that are going to be helping you out if you have a problem. They’ll give you classes on your machine, etc. Also, buy the best you can afford and make sure to try it out as well as others to see what you like best. If you’re in the Boston area, the Button Box is an awesome quilt shop, I definitely recommend checking out their Pfaff selection. I have my eye on the Pfaff Quilt Expression 4.0… One day! Wow – the sports car of the sewing machine world! thanks for the post. 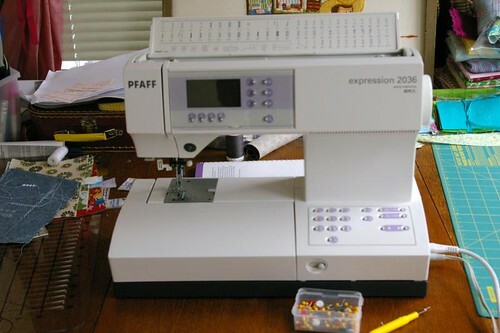 i am looking at a minimally used pfaff 2027 for $750 myself. i don’t know if that’s a good price or not though? any advice from anyone?